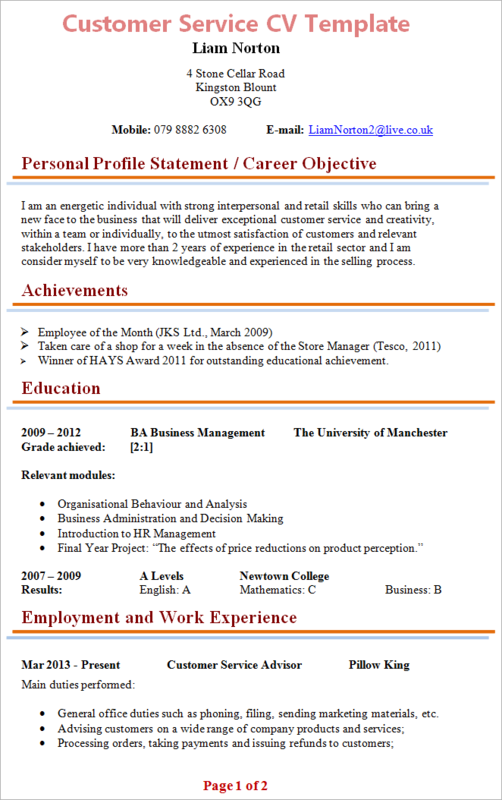 Tip: Use the Customer Service CV Template below as an example to help you write your own personal and fully-tailored CV. I am an energetic individual with strong interpersonal and retail skills who can bring a new face to the business that will deliver exceptional customer service and creativity, within a team or individually, to the utmost satisfaction of relevant stakeholders. I have more than two years of experience in the retail sector, and I consider myself to be very knowledgeable and experienced in the selling process. Winner of HAYS Award 2011 for outstanding educational achievement. General office duties such as phoning, filing, sending marketing materials, etc. Tidying up the shop floor and taking care of stock orders and documentation. Addressing questions, complaints and concerns in accordance with company policy. Jun 2012 – Dec 2012 Retail Shop Assistant Hit or Miss Ltd.
Researching competitor’s products, special offers and seasonal promotions. IT literate (with good knowledge of Microsoft Office). My hobbies include reading, writing, watching TV, spending time with my family and volunteering at local charity schemes. At University, I was very active in societies which eventually led me to set up the Business Partnership Society (BPS) together with my peers. Manager, Hit or Miss Ltd. Your CV should clearly illustrate the reasons that would make you a great Customer Service Advisor if you were hired, such as; respecting customers and ensuring that all their needs and requirements are met, having excellent interpersonal and communication skills to deal with stakeholders and third-parties on a daily basis and having a real concern for the success of the company that you are employed by.